All hailed Facebook – finally there was something they could build their anti-Russian campaign on. It is of course idiotic to believe that 3,000 ads for which some $100,000 was spent over two years would somehow effect a U.S. election. In a U.S. presidential election more than $2 billion is spend on advertising. Facebook’s ad revenue per year is some $27 billion. The batch of more than 3,000 Russian-bought ads that Facebook is preparing to turn over to Congress shows a deep understanding of social divides in American society, with some ads promoting African American rights groups, including Black Lives Matter, and others suggesting that these same groups pose a rising political threat, say people familiar with the covert influence campaign.The Russian campaign — taking advantage of Facebook’s ability to send contrary messages to different groups of users based on their political and demographic characteristics — also sought to sow discord among religious groups. Other ads highlighted support for Democrat Hillary Clinton among Muslim women. How pro- and anti-Black Lives Matter ads might have suppressed voter turnout will stay Senator Warner’s secret. Instead of “Russia helped Trump” we now get an even more implausible “Russia wanted to sow discord” narrative. As if Donald Trump’s campaign style had not been enough to cause controversies. The Atlantic Council is financed by foreign (Middle East) interest, NATO and the oil- and weapon industry. It has been a major driver of the anti-Russian new Cold War narrative. Its “Digital Forensic Research Lab” indeed claims to have found a few Twitter accounts which have their names written in Cyrillic(!) letters. Only Russian influence accounts would ever do that! It even found one tweet warning about election fraud that was retweeted 500(!) times. That MUST have helped the AfD to receive more than 12% of the 47 million cast votes in Germany – (not!). Election fraud in the German pen and paper balloting is nearly impossible. No one will take vague claims thereof as serious. It is simply not an issue in Germany and any such claim would not effect the vote. 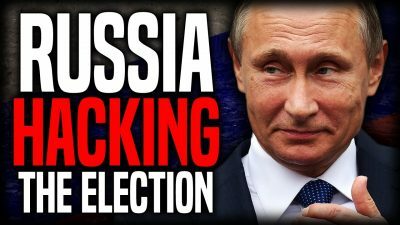 German officials have found no sign of “Russian” election hacking or of voting fraud. [O]ne of the major publishers of online content friendly to the far-right [German] party is an American website financed in large part and lead by Jewish philanthropist Nina Rosenwald.Rosenwald’s site, the Gatestone Institute, publishes a steady flow of inflammatory content about the German election, focused on stoking fears about immigrants and Muslims. Allegations of “Russian influence” in U.S., French and German elections is made up from hot air. No evidence is or ever was presented to support these claims. Massive election interference by other foreign interests, like large Saudi donations to the Clinton Foundation, or Zionist Jewish financier support for extremist positions in Germany and France is ignored. The story about “Russian influence” was made up by the Democrats to explain Clinton’s loss of the election and to avoid looking at her personal responsibility for it. It also helps to push the new cold war narrative and to sell weapons. As no evidence was ever found to support the “Russian influence” campaign, Facebook and others come under pressure to deliver the “evidence” the U.S. intelligence services could not produce. The now resulting story of “sowing chaos” is something out of la-la-land. If there is something to learn from this sad story it is this: The lack of objectivity and journalistic integrity is a greater threat to western democracy than any “Russian influence” could ever be. Featured image is from Youtube.